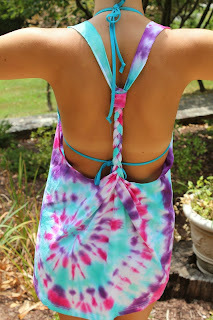 Here are some cute swimming suit cover-ups that I found out there that you can make yourself. They all have great tutorials too. This is made from a big white v-neck t-shirt. This picture and the tutorial can be found at lovemaegan.com. Super cute and no sewing necessary. This one is also made from a large white t-shirt. Picture and tutorial can be found at Adventures of a Middle Sister. This one is made from a piece of fabric. Picture and tutorial can be found at laviediy.blogspot.com. Now to decide which one to make? Maybe all of them.